You’re in for a little ecology now so please skip if you’re not into that^^The usual colouring for lobsters in the Atlantic ocean is a greenish brown in American lobsters to dark blue in the European lobster species Homarus gammarus. But bright blue lobsters are a rare gift of nature! They have this particular shade due to a genetic aberration that causes them to produce more of a certain protein than others. This causes the unusual vivid blue colouring which I find absolutely beautiful! Sometimes, nature is totally unexpected, isn’t it? Therefore, when I spotted this amazing little brooch by Macon & Lesquoy I was totally taken. This is actually the first time I tried the Shein online shop. 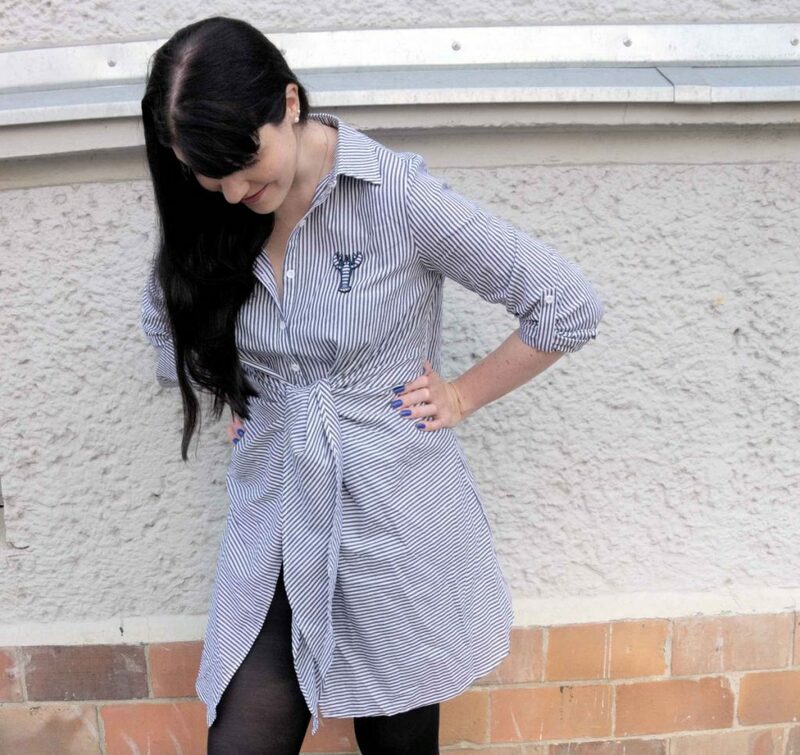 After I was contacted by them with the idea for a cooperation I got the opportunity to pick this amazing shirt dress. There were quite a few pieces I really liked in the shop but this striped dress seemed the perfect piece for both work and play. 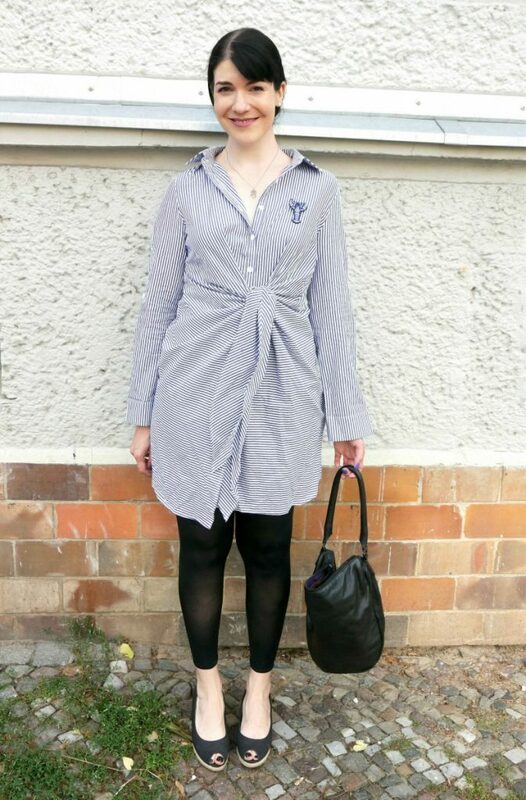 Besides, I like the avantgarde look of the tied front – it’s an unconventional and modern take on the classic shirt dress. I was impressed that the dress is pure cotton and very well made when I received it. I think it will be a fun and welcome addition to my office wardrobe! As it’s quite short I opted for black leggings and classic peeptoes to go with it. 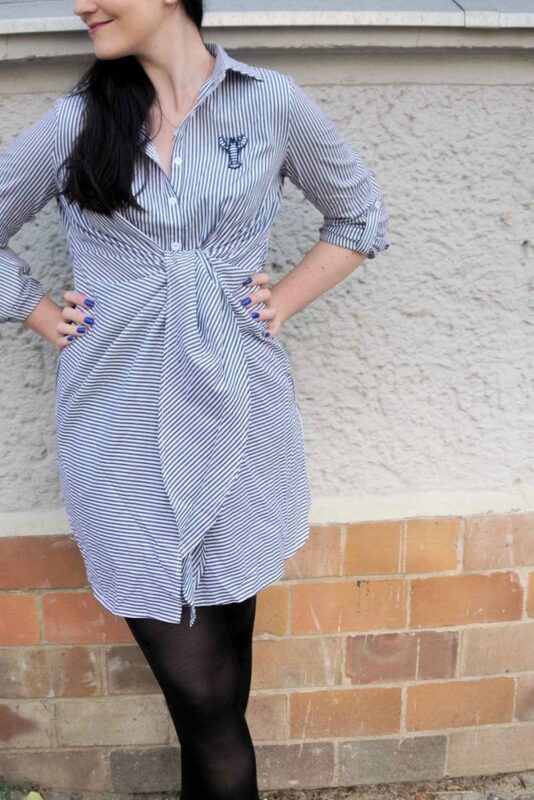 Do you like striped dresses as well? Disclaimer: This post was written in cooperation with Shein and I received a free sample for review. 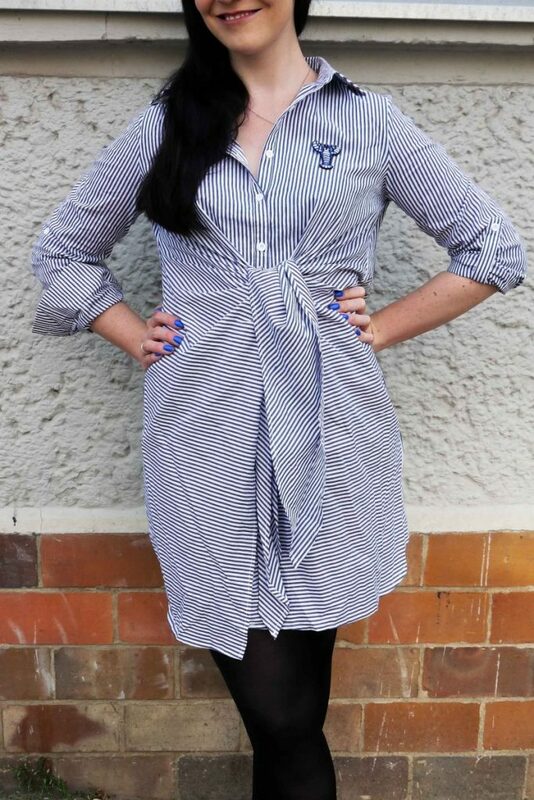 How do you like my new shirt dress? Have you shopped at Shein before? So cool and look great with blue nails! 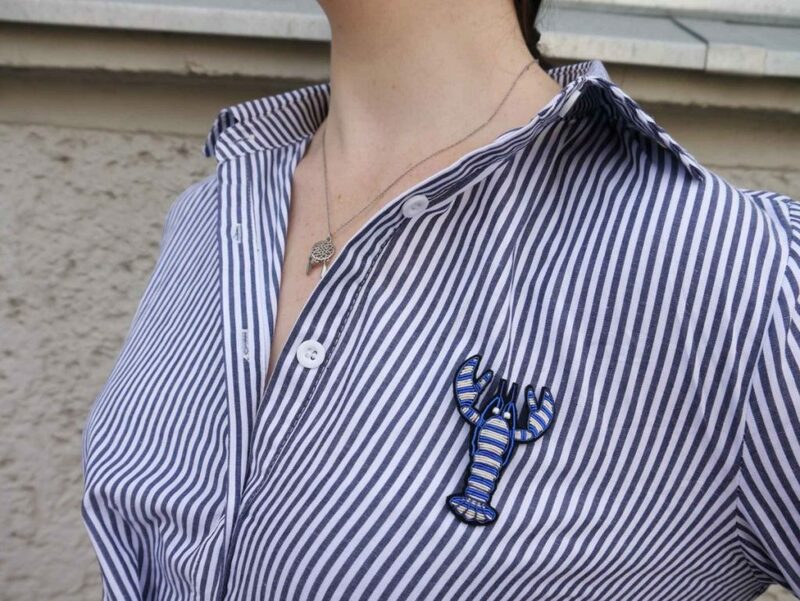 Die Bluse ist ja echt süß! 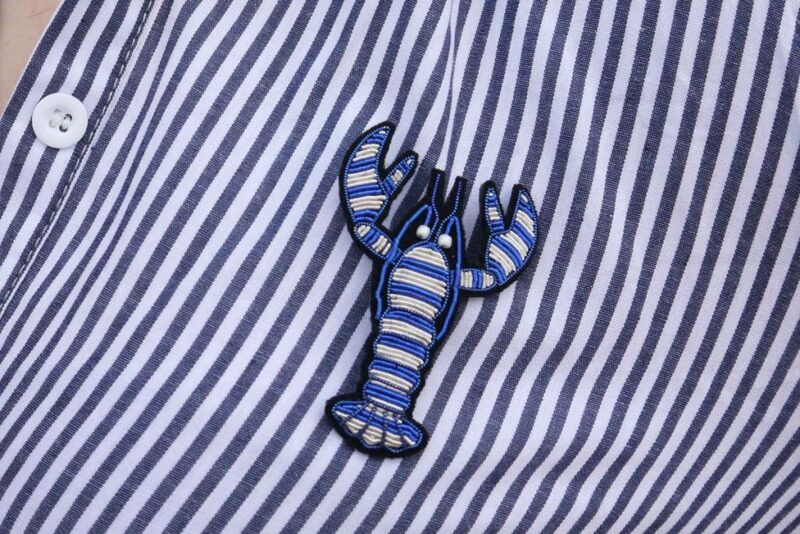 The lobster applique is so cute! 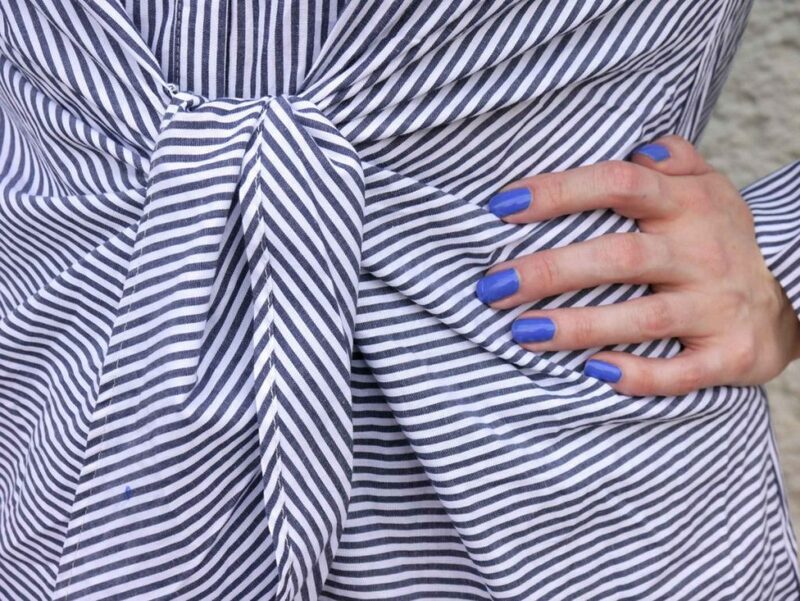 Lovely shirt dress and cool mani! Looking lovely! I hope you have a nice summer! 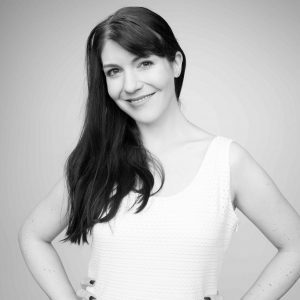 Das Kleid steht dir gut. Streifen sind ja momentan wieder total angesagt. How cool is that you include a little lesson on nature with a fashion post? I have a shirt and an off-shoulder dress in my list to buy for this year and I’m really loving yours. 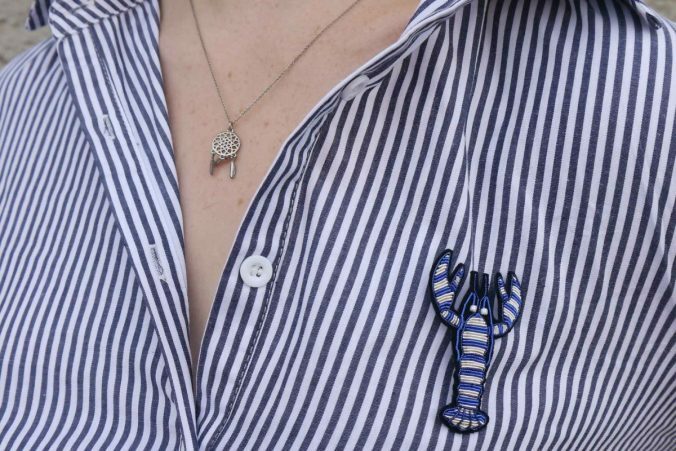 That lobster emblem is so cute and I’m also digging the stripes, loose fit and the knot in the middle. Such a darling piece! that little lobster top is so cute! I saw a photo of blue lobster some time ago and I was surprised, I wish I’d see one in person :) Style and the colour of the dress is beautiful, love the knot detail! I love how it’s tied in the middle! So cute! The dress is so cute and very chic to wear around in an office setting! And no I didn’t know those kind of lobsters existed; thanks for the quick science lesson!